Cherokee’s elk are wild, native animals. Elk have lived on this landscape for thousands of years. They coexisted with Cherokee people and played an important role in the Southern Appalachian ecosystem. By the 1800s, though, they were eradicated – hunting and habitat loss had driven them to local extinction. After two centuries of absence, elk were reintroduced to Great Smoky Mountains National Park in 2001. Since then, the herd has grown and spread into areas adjoining the Park, including EBCI lands. However, it’s still a small population in need of study and protection. 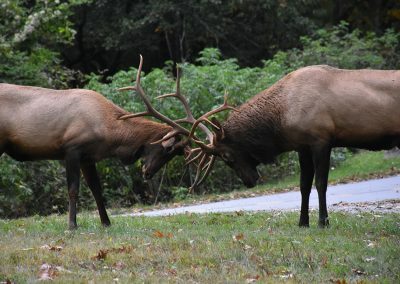 In 2010, Principal Chief Hicks signed a Memorandum of Understanding between the Park and the EBCI outlining the Tribe’s support for cooperative elk management efforts. The historic role of elk in Cherokee culture remains a mystery. If there are stories about elk, they’ve been lost either to time or to the uncertainties of language – we don’t know if stories might have referred to elk simply as ᎠᏫ (deer). Trash midden excavations from old settlements show that elk were not a major part of Cherokee diets. They don’t seem to have been heavily hunted or managed, although gardens may have attracted them then as they sometimes do today. Every species on the landscape is important to Cherokee culture, though, and we suspect a relationship between Cherokee and elk existed, even if elk were not often harvested. Unfortunately, because no one is alive today who lived alongside elk, we do not know exactly how Cherokee maintained their important gardens while coexisting with elk. We suspect that fences and different elk behaviors could explain their coexistence. How many elk are there? 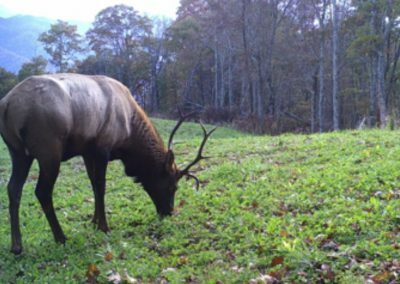 As of 2018, minimum counts of the southern Appalachian elk population have never exceeded 100. However, these minimum counts could be missing individuals, so we are working to establish a better method to survey their population. EBCI Fisheries & Wildlife Management staff have begun using DNA from elk feces to learn more about how many individuals are using Tribal lands. We are working with the National Park Service, North Carolina Wildlife Resources Commission, and other partners to learn more about the status, size, and movements of our local population of elk. Even if our counts are missing some elk, our overall population is very low by most standards. A single year of high mortality – from vehicle collisions, depredation, or other causes – could wipe out the increases we’ve seen in the size of the Oconaluftee herd. Elk can often be seen in downtown Cherokee and other areas on and off Tribal lands, and viewing them is a major attraction. Elk can be dangerous, though! 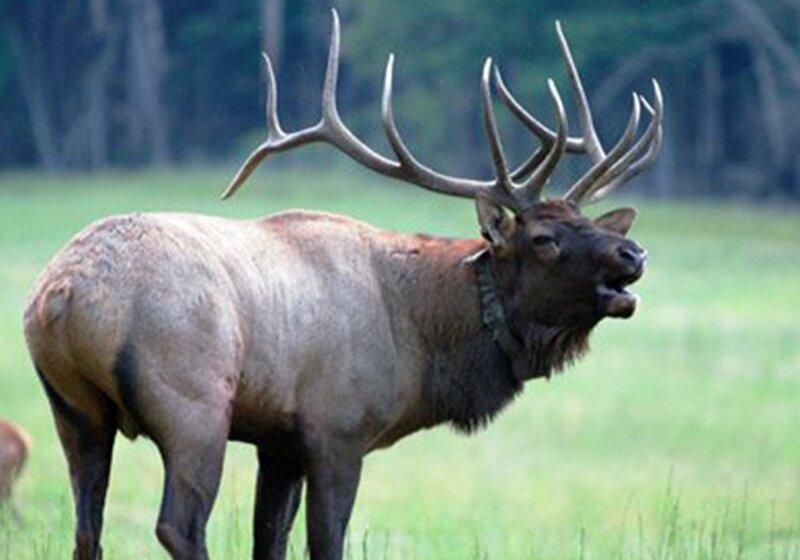 Males are especially aggressive during “rut” (breeding season), in September and October. They can often be heard bugling and even seen clashing antlers in combat, but should not be approached. Even after the rut is over, their testosterone levels remain high well into the winter, and aggressive behavior may continue. Similarly, after calves are born in late spring and early summer, females aggressively protect their young. Even when they’re not behaving aggressively, elk are large, wild animals. Do not approach them. Keep dogs on-leash and maintain a safe viewing distance of at least 50 yards. Please also exercise courtesy and do not block traffic or pull onto residential property in order to view elk. Elk locking antlers during rut. An elk calf being collared. 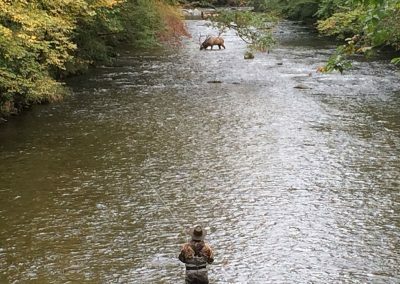 Elk and a fisherman share the river. While the vast majority of EBCI gardeners agree that they enjoy elk, some have experienced damage to their agricultural fields and gardens. If this is a concern for you, we recommend installing electric fencing as the best way to keep elk out. Electric fencing works not only by providing a physical barrier, but also by training them to avoid an area in the future. In our experience, elk nearly always avoid electric fences if they’ve been installed correctly. After one experience with an unpleasant (though harmless) electric shock, they learn to stay away. Fisheries & Wildlife Management staff are available to provide consultations and technical assistance about how to effectively use fencing. They can advise on how to design fencing specifically for deterring elk. Please contact us at (828) 359-6110 for further information. We are not able to offer financial assistance for fencing or elk damages at this time. Currently, elk, like deer, are a protected animal under Cherokee Code (Sec. 113-5a6) and cannot be hunted on tribal lands. Many elk sightings also occur within residential areas, where firearm discharge is prohibited (Sec. 113-5a1). We sometimes get questions about whether road-killed elk can be donated to the community for food and cultural uses. While we support restoring these animals to Cherokee culture, there are important safety considerations involved in using their meat. When researchers handle live elk, they use a sedative that lingers in the elk’s body and is toxic to humans. Wild meat also carries a risk of disease. Biologists must evaluate these animals before they can be used. In the future, we would like to develop a process for using elk for cultural interests. If you encounter an elk carcass, please contact Natural Resource Enforcement (828-359-6169) or Tribal Dispatch (828-497-4131) immediately. We need to account for every animal as we work to protect their herd. Memorandum of Understanding – This 2011 agreement between EBCI and the National Park Service outlines each agency’s commitment to cooperative elk management over a 15-year term. It was signed by Principal Chief Michell Hicks. Elk Management Protocol – This document, prepared by EBCI Fisheries & Wildlife Management and Natural Resource Enforcement staff, outlines Tribal elk management policies and procedures. The appendices contain detailed information on fencing for elk and deer. 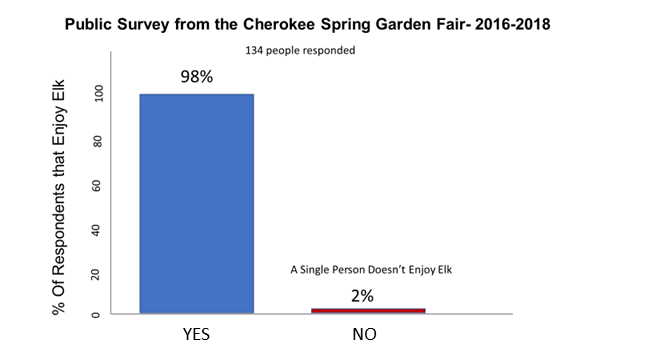 Spring Garden Fair Survey – From 2016 through 2018, EBCI Fisheries & Wildlife Management staff surveyed Cherokee Spring Garden Fair attendees on their attitudes toward elk. This document summarizes their responses. Elk Viewing Tips – Visit Cherokee has a helpful overview and Q&A for those hoping to see elk on Cherokee lands. 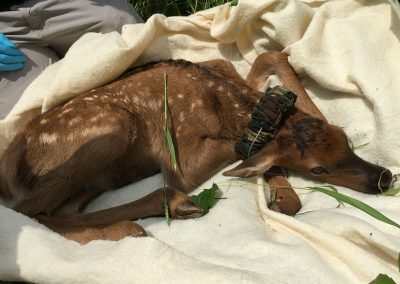 Elk Damage Handbook and Fencing to Exclude Deer – Both of these websites offer detailed and helpful information on using fencing and other techniques to prevent cervid (elk & deer) damage to gardens and crops. The elk of Great Smoky Mountains National Park and surrounding areas receive frequent media attention.  The links below offer a selection of recent media coverage on elk in Cherokee. Feb. 13, 2019 – Elk fest coming to Maggie. Smoky Mountain News. EBCI Natural Resources is a partner in the upcoming inaugural Smoky Mountain Elk Fest (September 13-15, 2019). Feb. 11, 2019 – Increasing elk population results in more human encounters. Cherokee One Feather. Also see EBCI Supervisory Biologist Caleb Hickman’s commentary on this article here. Feb. 29, 2016 – Elk management: it’s complicated. Editorial, Cherokee One Feather. Jan. 6, 2016 – Council discusses elk and their place in the community. Cherokee One Feather. Nov. 5, 2015 – Should the tribe legalize hunting of the elk on tribal lands? Cherokee One Feather. 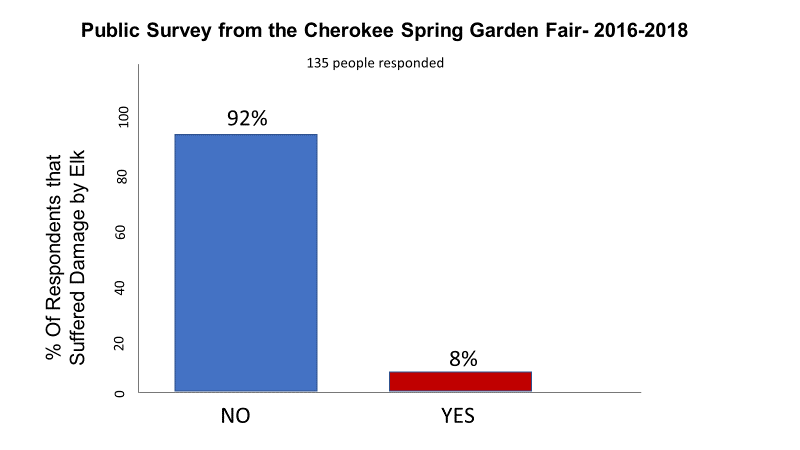 Results of a poll on the possibility of elk hunting in Cherokee (17% in favor, 83% against).